Home About What Is A Salle? A Salle, or Salle d’Armes (literally a “room of weapons”), is a fencing school run by a professional fencing instructor. The term is French, as French is the dominant international language of the sport. Salles are commonly named after the professional Maitre d’Armes (Fencing Master) who owns and operates them. 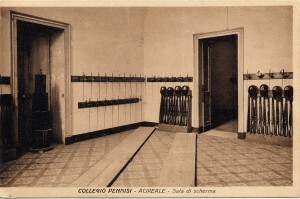 An Italian Salle around 1900. Note the rack of rifles for bayonet fencing and the wooden strips in the foreground. Throughout the history of classical and modern fencing Salle’s have been the focal point for learning the technique and tactics of the sport, a center for the interaction of fencers both on and off the strip, and the professional homes of Fencing Masters. A Salle differs from a club. The primary purpose of a Salle is instruction in the sport of fencing and the preparation of athletic competitors – the primary purpose of a club is to provide a place for fencers to fence together and an organization which they can represent in competition. The focus in the Salle is on structured group lessons and on individual lessons. When fencers fence with each other, the objective is for them to practice new material learned in their lessons or to meet specific training goals. The focus in the club is on fencing bouts with other fencers, for recreation or for competition preparation. These functions are not exclusive, clubs offer classes and individual instruction and salles have open fencing and field teams. However, the focus at Salle Green is on instruction for both competitors and recreational fencers and preparation of our competitive team. Salle Green is equipped to train both classical and modern competitive fencers. Our fencing floor is laid with modern athletic flooring designed specifically for indoor sports – three 32 foot strips for lessons and practice, and one 20 foot classical fencing strip. 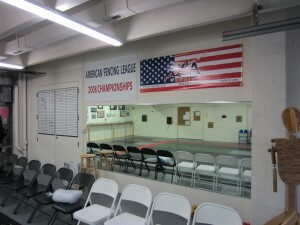 The 32 foot strips are an old standard used by the Amateur Fencers League of America in the 1960s, and provide adequate space for practice bouts. In addition they can be configured as 20 foot strips for classical fencing. 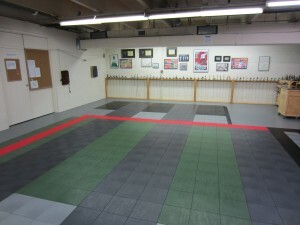 The floor is marked with a 20 foot square for study of Medieval and Renaissance fencing. 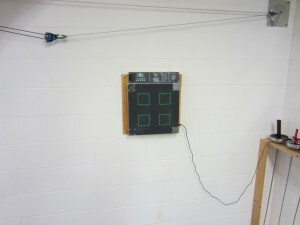 One strip is configured with an overhead electrical system for electric foil, epee, or sabre – an Eigertek Eclipse 3 weapon scoring box and a bungee cord reel system permanently mounted on the wall. Two additional strips can be configured when needed with portable scoring machines, floor cables, and reels. 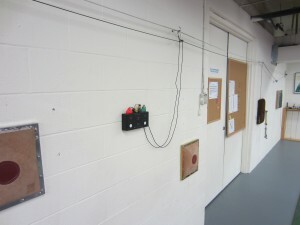 In addition, we use individual weapon trainer boxes for foil and epee bouting, and the Hitmate system for epee bouting. One wall is lined with mirrors to assist in assessing movement and technique. We have found this to be a very important tool in teaching good movement and in identifying problems with both movement and guard positioning. We have two up to date Target Speed electronic speed and accuracy training pads, a master’s arm for practicing blade work, a spadassin (a training dummy), a selection of training balls, and four lunging pads. We have a full range of different weapon grips available for fencers to test and identify the specific grip that best fits their hands, as well as stock of weapons for our Beginners Classes. All equipment is maintained on a weekly basis by our armorer’s assistant. For fencers interested in improving their strength, we have a multiple station resistance training machine, bands, wearable weights, dumbbells, and other resistance training equipment. One of the most important tools is the bulletin board on which we post weekly pool seedings, current standings of our competitors and points lists, monthly totals of bouts fenced and performance measures, and progress toward goals. Our training program is data driven, and making this information available to our members is key to their goal setting and performance monitoring. Thank you for visiting our website. We post regular updates on our programs and the successes of our members on the social media sites linked below. We appreciate your liking or following us.